I've always wanted to have a garden railway but thought it would be too expensive. One day we managed to purchase some second-hand material for our terrace and when I saw she and our son loved it, I told my wife: Wouldn't it be great if it had a proper track in the garden? She agreed and before I knew it, I was digging! As our garden is more of a longish type, the track parallels the wall towards the next door neighbours and has a loop at each end, basically forming a dogbone. The railway boasts a tunnel, a nice steel bridge (laser cut in England!) and all the track is built with true to scale Code 180 stainless steel rails, purchased also from England. We have two sidings for trains passing each other and one of the reversal loops circles our vegetable garden. Rolling stock is from LGB, USA Trains, Aristo-Craft, PIKO and Bachmann (Spectrum). 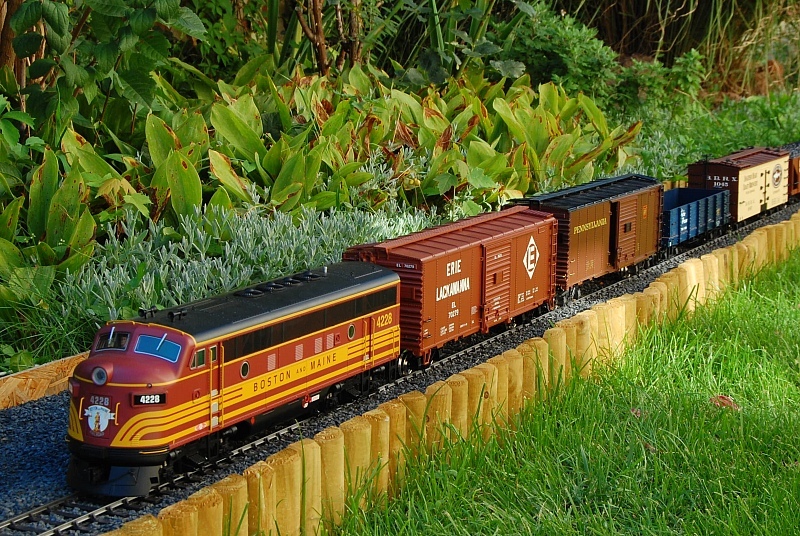 We do like to equip our locos with sound chips so you can enjoy American diesels, a Taurus electric and an RhB Crocodile, an old streetcar and a logging 2-6-6-2 Mallet, hauling appropriate wagons and carriages. As the garden railway is very much up front in the garden, we will have to ask you to be very cautious if playing ballgames or arriving with small children who do not yet value such equipment. We will happily show you how the garden railway works and have an evening's bashing session, should weather and our other commitments permit. We love to run the trains around anyway, after all that's why we (I) built it in the first place!